The Vincci Tenerife Golf 4* is the complete golf destination, located just minutes from the Reina Sofia Airport and immediately adjacent to the beach, with the superb Golf Del Sur onsite. Arguably the most well-rounded golf holiday option on the island of Tenerife, you get all the beauty of a beachfront location with easy access to the local courses. Found on the popular south side of the island, the hotel puts you close to all the action, but this great venue boasts more than just a top location. Vincci Tenerife Golf will greet guests with a warm welcome and first-class customer service, as well as offering a range of great facilities on-site. The resort is found in the town of San Miguel de Abona, one of the most popular destinations on the island, and is within easy reach of Adeje, Arona and Granadilla. 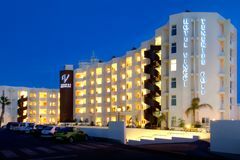 Vincci Tenerife Golf guests will be welcomed to one of the hotel's 125 rooms and suites, all of which are fully equipped with air-conditioning, mini-bar, internet connectivity, satellite television and direct dial telephone. Contemporary styling and modern furnishings throughout make the hotel a delightful place to relax while the levels of service are excellent. With the proximity to Golf Del Sur, the beaches and local attractions, Vincci Tenerife Golf is an outstanding choice for a golf holiday in the sunny Canaries. In addition to the excellent outdoor swimming pool and tennis court, the resort boasts the Nammu Areas SPA with sauna, Turkish bath, active pool and massage room. Nothing wrong with this place at all. Very well located with bars and restaurants a short walk away. Hotel bar a bit basic, pool area a bit small, but a perfect base for a golfing holiday if you are not looking for 5 star luxury. Good food but expensive drinks, and no coffee available after the evening meal. The hotel is now dated - our bathroom fittings were at least twenty years old and the waste plugs on both bath and wash basin didn't work. A major negative for us was the lack of tea/coffee making facilities in our room. The staff and cleanliness of the hotel was very good. We had no iron, but were told we had to pay to have our clothes ironed !, we bought an iron and did it ourselves. No tea / coffee facilities in the room and so had to go out for this.